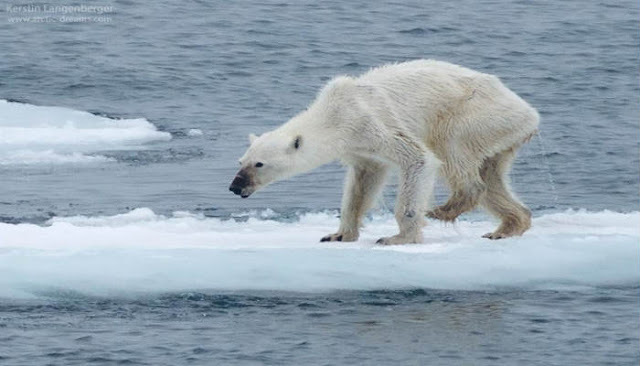 Wildlife photographer Kerstin Langenberger shared this heartbreaking image of a starving polar bear which shows the drastic impact climate change is having on its natural habitat. “For tourists and wildlife photographers, the main reason to come to Svalbard is to see polar bears. And yes, usually we find them: beautiful bears, photogenic bears, playful or even at a kill. At first glance, everything is as it has always been in one of the most easily accessible polar bear populations of the world, strongly protected and doing good, so some scientists say. But are they really doing good, the bears up here? I am a critically minded person, and I observe. I see the summers being so pleasant (and warm) as never before. I see the glaciers calving, retreating dozens to hundreds of metres every year. I see the pack ice disappearing in record speed. Yes, I have seen bears in good shape – but I have also seen dead and starving polar bears. Bears walking on the shores, looking for food, bears trying to hunt reindeer, eating bird’s eggs, moss and seaweed. And I realized that the fat bears are nearly exclusively males which stay on the pack ice all year long. The females, on the other hand, which den on land to give birth to their young, are often slim. With the pack ice retreating further and further north every year, they tend to be stuck on land where there’s not much food. In the first year, they lose their first cub. In the second year, they lose their second (and last) cub. Only once I have seen a mother with a nearly independent cub. Only few times I have seen beautifully fat mothers with beautifully fat young. Many times I have seen horribly thin bears, and those were exclusively females – like this one here. A mere skeleton, hurt on her front leg, possibly by a desperate attempt to hunt a walrus while she was stuck on land.